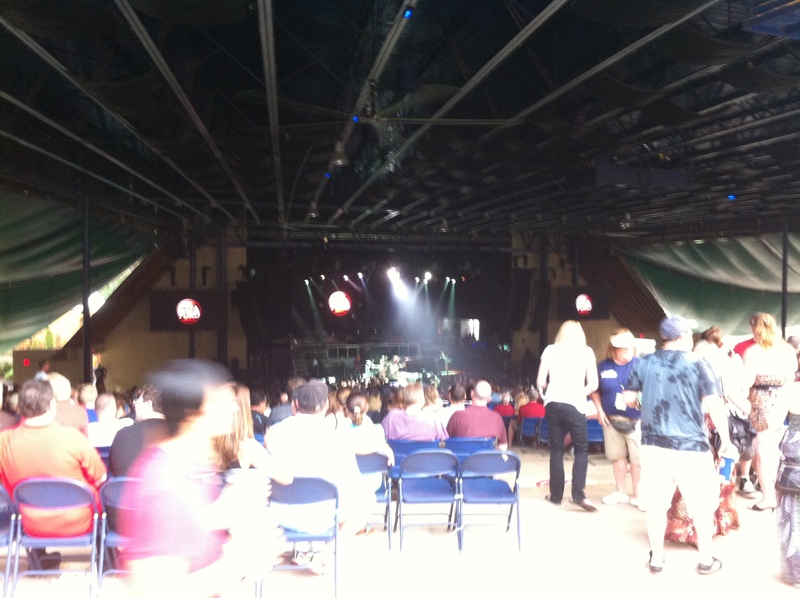 What a great night for 1980s music at Merriweather Post Pavilion in Columbia, MD for the Rock of Ages Tour with Lita Ford, Poison and Def Leppard. I was transformed back into high school. I didn’t know if it was 2012 or 1988 – and neither did a lot of other people from the looks of them. 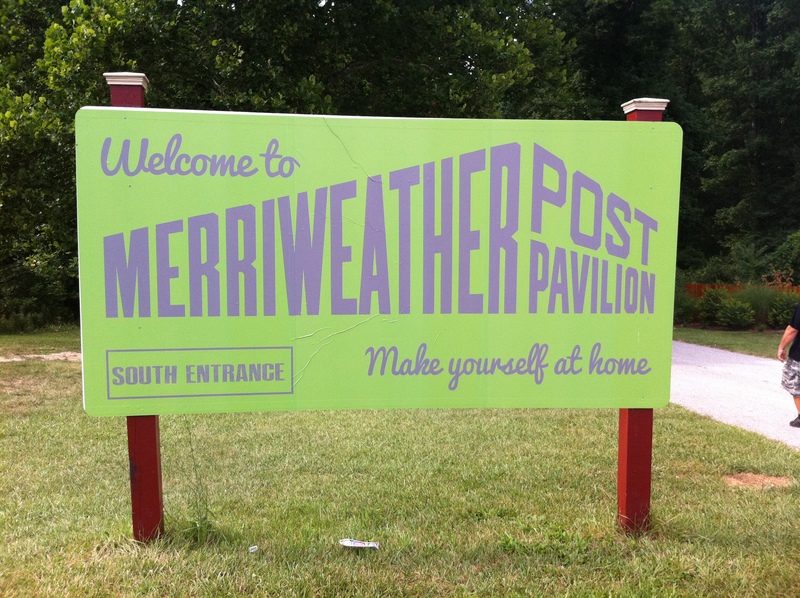 I arrived at Merriweather Post Pavilion (just a few miles from my house) at 4:30 pm for the special ‘Gate Crashers’ facebook offer. This entitled us to enter before the gates opened at 5:30 pm, free food, $4. beers (which are normally $8.) and possible ticket upgrades. It was kind of cool. 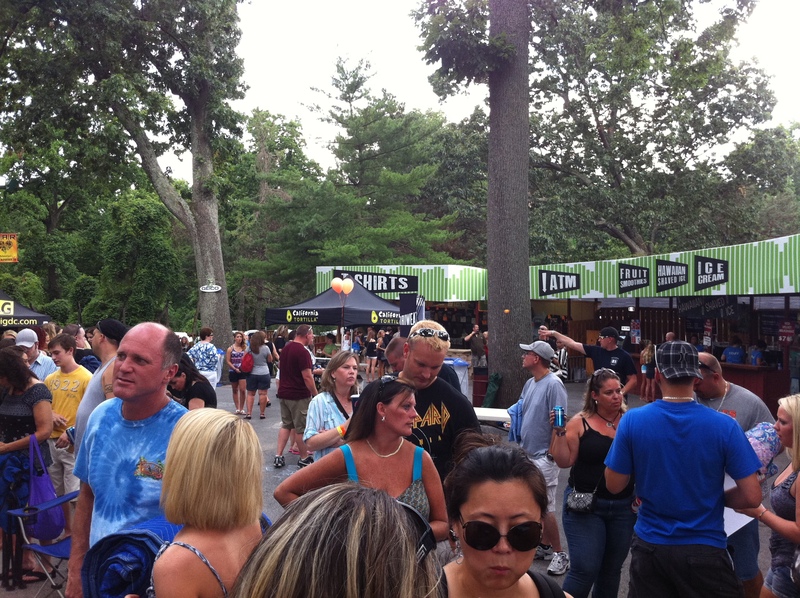 We got let into the food plaza at 4:30, but not onto the lawn until 5:25 – but it was before everyone else. I got my 1 free tortilla from California Tortilla, plus a coupon for 1 free burito when I visit their store. I got my $4. 12oz can of Budweiser. And I signed up for a ticket upgrade, which I did not get. Once we were finally allowed on the lawn, I secured my spot right up front behind the sidewalk right behind the pavilion. Within an hour, my friends showed up. 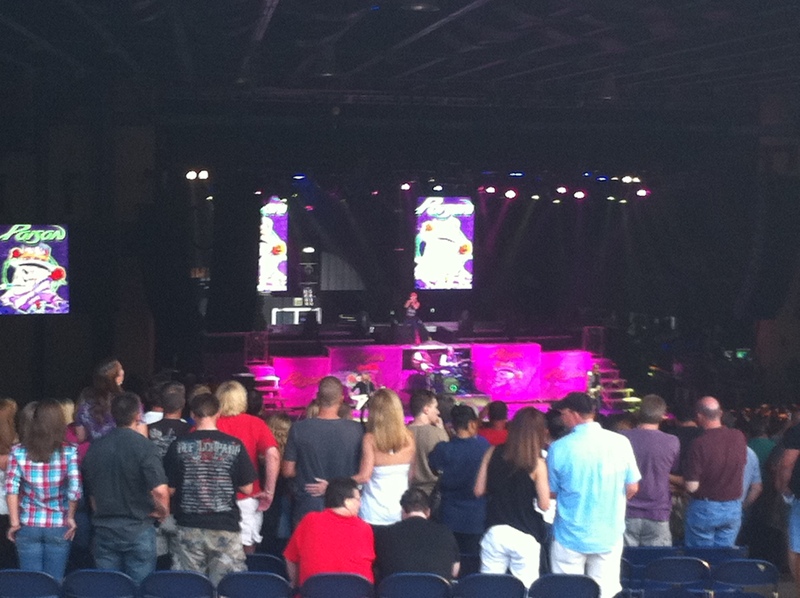 At 6:50 pm Lita Ford took the stage, and we realized we were actually too close to see her because the stage was so low – the pavilion and lawn are slanted up from the stage. So after a little readjusting, we were able to see the stage. Unfortunately, the screens were not on. But I enjoyed Kiss Me Deadly, which is the only Lita Ford song I know. She still rocks. At 7:40 pm Poison took the stage and the screens were still not on, which was a bit disappointing because I really wanted to see Bret Michaels up close. He really knows how to work the crowd and loves to perform. 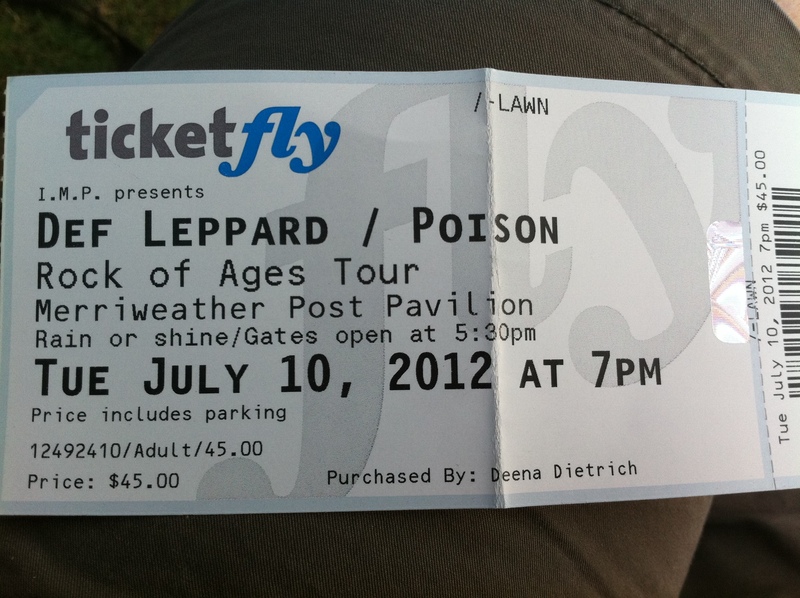 Poison sounded great and played my favorite Every Rose Has Its Thorn. After a two-minute countdown on the screens (yes the screens were finally on! 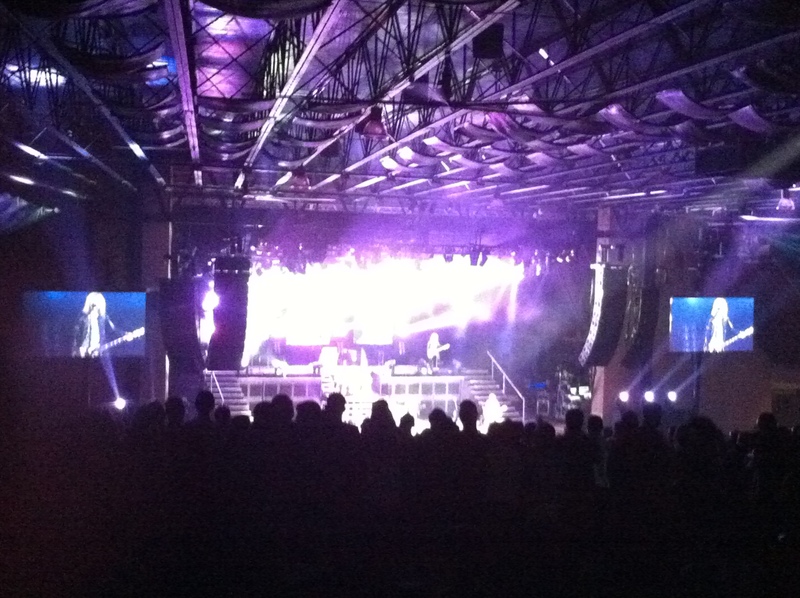 ), Def Leppard took the stage at 9:10 pm. They were fantastic, definitely the highlight of the night for me. I was SO excited to finally see Rick Allen play drums live. He is fantastic! Some advice for U2, place Larry on a risers like Rick Allen! Def Leppard played all their hits including my favorite (and everyone else’s) Pour Some Sugar On Me. It was a great, relaxing night outside under the stars with old friends listening to some our favorite music from our youth.